In 1993 and 1994, a severe epidemic of canine distemper virus (CDV) swept through the Serengeti National Park in north-western Tanzania and reduced the lion population by about a third. It also hit the spotted hyena, a keystone social predator of the African Savannah. Many young hyenas showed clinical symptoms of the disease and died. CDV was probably introduced to Africa in the early 20th century. The epidemic in lions and hyenas in the early 90s was caused by a novel strain that was highly contagious for these two carnivore species. The lion population in the park recovered relatively quickly, reaching its pre-epidemic size within a period of a few years. In contrast, the projected recovery of the hyena population required more than a decade, as the current study reveals. The main reason for its slow recovery lies probably in the relatively slow rate of reproduction of the species, the researchers say. "Spotted hyenas invest much more energy in raising their cubs than lions" says Sarah Benhaiem, a scientist at Leibniz-IZW. "Females give birth to only one or two cubs per litter and then feed them with highly nutritious milk for almost up to two years, which is exceptionally long for a carnivore." Species with low reproductive rates are likely to be particularly at risk from human-made threats such as the introduction of exotic diseases, which CDV is in Africa. "The study shows that such threats apply even to animal populations in one of Africa's largest National Parks" adds Marion L. East (Leibniz-IZW). The mathematical model ("matrix model") included data from 625 individually known female spotted hyenas, collected as part of a long-term research project between 1990 and 2010. An extensive and diverse data base on all these females was compiled, which included information on social interactions, clinical signs of disease, molecular and immunological evidence of infection and deaths. 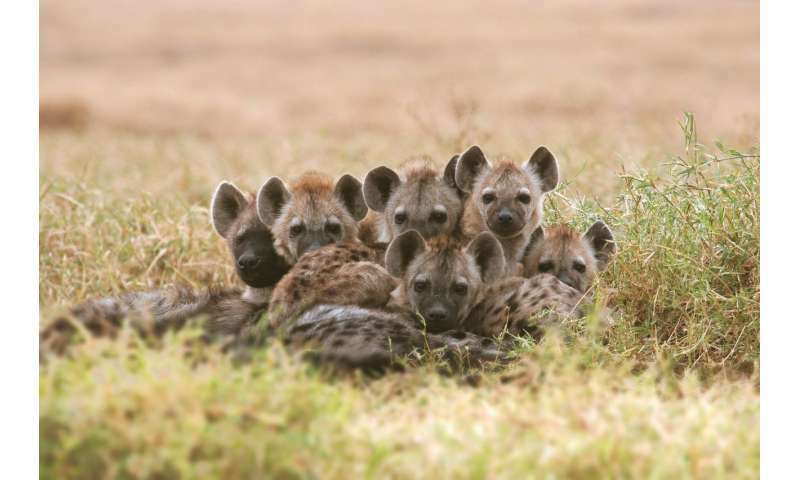 This allowed the researchers to build a complex model with three relevant layers of information: disease data were combined with information on the social status of the female hyenas and data on their age and reproductive state. "To our knowledge, this level of sophistication was not reached by previous matrix models developed for wildlife diseases," comment Heribert Hofer (Leibniz-IZW) and Jean-Dominique Lebreton (CEFE). The current study builds on a previous work conducted by the same team, and published in the journal Functional Ecology in March 2018. In their previous work, the authors investigated how the CDV epidemic affected the mortality of individuals, and discovered that cubs of high-ranking females had a higher chance to survive the disease than those of low-ranking females. "High-ranking females have preferential access to hunted prey, which means that they are able to nurse their cubs more often. As a result, their cubs are stronger and grow faster" says Lucile Marescot (formerly at Leibniz-IZW, now at CEFE). This likely explains why the current study found that high-ranking females are essential to the recovery of the population. The new model made it possible to determine for the first time the "basic reproduction number" (R0) of the disease in spotted hyenas. "This is a useful measure in epidemiology because it tells us if and how quickly an infectious disease will spread in a population" explains Olivier Gimenez (CEFE). During the epidemic, this number was almost six, indicating that an infected hyena could transmit the virus to six other healthy hyenas. "This is a fairly high value, similar to that of measles in humans, which also explains why the epidemic spread so rapidly in the 1990s," says Stephanie Kramer-Schadt (Leibniz-IZW). What is true for measles in humans also applies to CDV in hyenas: if young survive the infection they develop antibodies and gain immunity for the rest of their life. The study highlights the importance of age and social status in the spread of a childhood illness.